During a brand new interview with Rock Song Of The Day, MEGADETH bassist David Ellefson was asked what his expectations are in terms of the composition of the band's next album, both lyrically and musically. 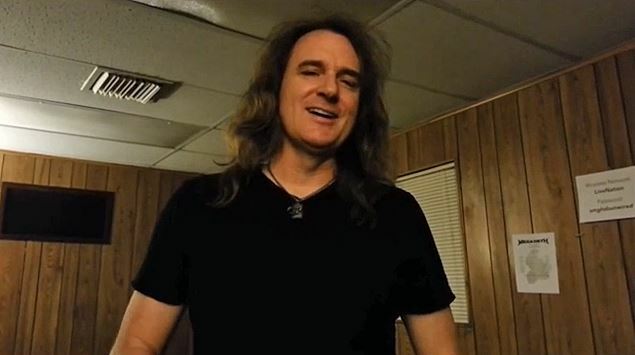 "Every album offers something a bit different," Ellefson said. "I think [2013's] 'Super Collider' was this serendipitous moment that encompassed variety from our 30-year career, which was ironic since it actually was our 30-year anniversary last year. It wasn't planned that way, it just sort of happened. But, moving forward, there is a feeling within the band now to take a different approach on the next record, one that probably means new locations, new producers/engineers, and so forth." "It's always exciting to see how music connects people in other cultures," he said. "It's like the things that often divide people (language, politics and religion) suddenly disappear when everyone comes together in the name of music, especially with heavy metal." He continued: "As far as touring goes, there are certain challenges in terms of fatigue from traveling across time zones, language barriers, show production elements and creature comforts that can throw you off when traveling abroad. It forces you to roll with the punches. You learn to relax into the elements and absorb them rather than fight against them. The audience usually remembers the overall experience of the show and is usually not even aware of the details of things that aren't to your liking. So, it's best to just get on the stage and do your thing, especially in the larger festival settings. "As for tour dates, we've spent a great deal of time in North America these past few months so aside from a couple shows in Las Vegas and Tucson we are spending most of our year in other parts of the world." "Super Collider" has sold less than 80,000 copies in the United States since its June 4, 2013 release. The CD arrived in stores via MEGADETH mainman Dave Mustaine's new label, Tradecraft, distributed by Universal Music Enterprises (UMe). "I think 'Super Collider' is kind of like a really broad [distillation] of what our whole catalog represents," Mustaine told The Morning Call in an interview. "There's aggressive stuff, there's thrashy stuff, there's kind of more of the heavy metal stuff. There are someof the more introspective lyrics. There are some simple lyrics and soon and so forth. I think that's what really makes the record refreshing is that it shows everything that we've done. It's almost like a biopic of our career. It's a pretty good slice of everything I've learned over the years." MEGADETH's tour with FEAR FACTORY and NONPOINT kicked off on November 23 in St. Paul, Minnesota and wrapped on December 19 in Reno, Nevada.